Mint Inc., New York City. Special: $49.99 instead of $59.99. Special Sale on the beautiful spice grinder by Mint design! This item remains in factory brand new condition (new in the box) and was never used. Limited stock, subject to availability while supplies last. Free shipping within the continental US (excludes Alaska, Hawaii)! Please note that all Sales are final, no returns, no exchanges. This offer cannot be combined with any other discount or sale price. Don't miss our special "Sale" for great deals on overstocked, discontinued or clearance items upto 70% off list! 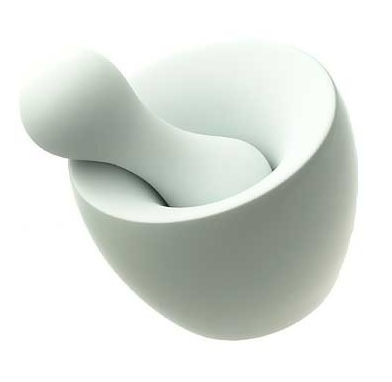 Porcelain "Full Contact" mortar & pestle spice grinder in beautifully sculptured porcelain. The profile of the pestle mirrors the interior of the mortar, so it produces a "full contact" effect. Visually, the weight of the pestle is enveloped by the mortar in an organic way. Fun to hold, and efficient in it's grinding function. Perfect for grinding small amounts of sea salt, peppercorns and other dry spices. The pestle and mortar interior are matte white; the mortar exterior is glazed shiny white. Hand-wash only. Size: 3.75" height x 5" diameter, pestle, 5.5" lenght.